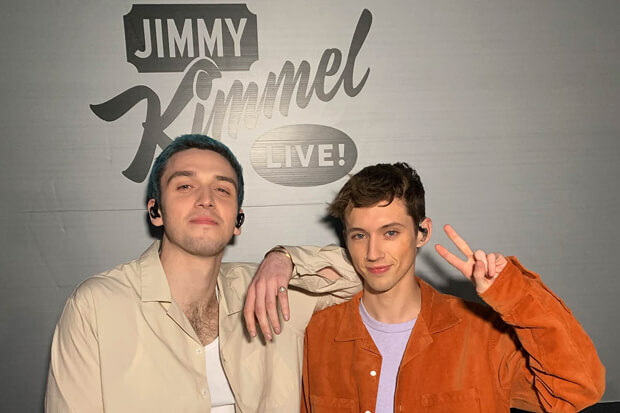 Heartbreak kings Troye Sivan and Lauv have a potentially massive hit on their hands with “I’m So Tired…” In just over two weeks, the instantly relatable anthem has amassed an impressive 24.5 million Spotify streams. And it is likely to pick up speed the longer it remains on the service’s daily global chart. Last night (February 7), the pair gave it another push with a promotional appearance on Jimmy Kimmel Live. Opening the performance sitting alone on a swing while couples cuddled up around him, Lauv delivered no shortage of soulful looks. Thankfully he was shortly joined by self-identifying BF (best friend, folks). Once he was there, they raised the energy with some sweet harmonies and playful antics. But that’s not all. The blue-haired hitmaker also treated the audience to a performance of breakout hit “I Like Me Better.” This time Lauv stripped things back a bit. Taking the stage with a two-piece band, he encouraged the audience to sing along while he danced across the stage. In all, it was a great moment for the duo. The cute and cheeky performance is sure to give the single another boost. And hopefully they have plans to follow it with an official video in the coming weeks. Off streaming and sales alone, it landed at number 86 on the Billboard Hot 100 this week. I’d like to see it climb even higher as we move into the spring. Check out the first televised performance of “I’m So Tired…” below.